We have seen some interesting things built out of Lego around these parts with all sorts of things from ships to robots. A new Lego creation has turned up that is somewhat gross, but cool at the same time. The construction is a frog that has been dissected and is made totally out of Lego bricks. 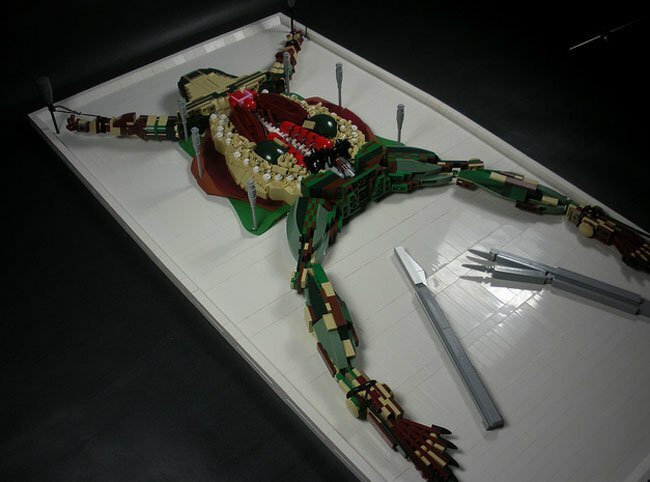 The builder made the dissected frog for the MOC Olympics where it was entered into the anatomy category. I’m not sure if it won, but it should have. It is very cool. It reminds me of 7th grade biology class. The best thing is that you can see the insides of the frog without having to smell the stuff that preserves them and having to cut a real frog up. Even the tablet, pins, tweezers, and scalpel are made from Lego.